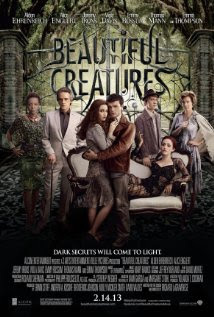 "Beautiful Creatures" (2012) starring Alden Ehrenreich, Alice Englert, Jeremy Irons, Emma Thompson and Viola Davis is supernatural romantic drama about witches in the South. Teenager Ethan Wate (Ehrenreich) has always lived in the small town of Gatlin, South Carolina. He yearns to get out of the town that stifles his creativity and bans all the books he finds interesting. When new student Lena Duchannes (Englert) arrives to town, things start to get interesting. Lena lives with her reclusive and very eccentric Uncle Macon (Irons) in a mansion just outside of town. The townsfolk imagine all kinds of strange, un-Christian goings-on at the mansion and that attitude immediately reflects on Lena who has a hard time fitting in at school. Of course Ethan, even though he is popular at school, feels like he is an outsider and immediately falls for Lena. He soon discovers Lena isn't the usual girl next door! She is a witch, or as they like to be called in this film - a caster, who is trying to learn to control formidable powers. Lena will soon turn 16 and on her sixteenth birthday her true nature will come out and her powers will thereafter be used for the light (good) or dark (evil). All her extended family is coming to town for a caster holiday and they are a very eclectic bunch. Ethan soon discovers from family friend Amma (Davis) that his family and Lena's are connected in the past and a curse from that past may soon affect Ethan and Lena. They must race to find a solution to this curse or Lena may inevitably go toward the dark. "Beautiful Creatures" is a visually appealing movie with lush settings and eclectic characters. It has lots of supernatural powers, interesting characters (including Emma Thompson playing a local religious woman who tries to direct the townsfolk against Lena and her family) and teen romance. If you like the "Twilight" movies, you'll probably enjoy this movie too.